The “Finnish Defence Forces – 100 Years at War and Peace” exhibition is divided into two parts. 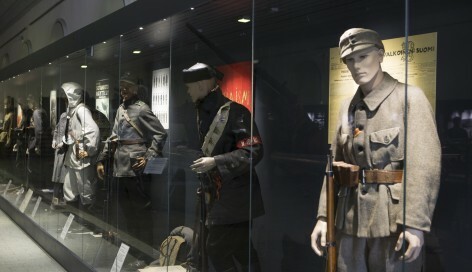 Exhibition in the Military Museum´s Manege tells about the four wars Finland has fought during its independce: the Civil War in 1918, the Winter War in 1939–1940, the Continuation War in 1941–1944 and the Lapland War in 1944–1945. The opening hours can be found in the calendar. Tickets: 7/4/0 € (adults, children 7-17 yrs/students/retirees, children under 7 yrs). You can visit also Submarine Vesikko with the same entrance ticket. Museum Card is valid in Military Museum’s Manege. The front of the entrance is slanting, with small differences in level which are difficult to cross with a wheelchair. The doors are rather large and heavy to open, but the museum staff will be happy to assist you as best they can. The exhibition is on one floor and the exhibition space is equipped with seats where you can sit and rest. The museum has accessible toilet facilities.